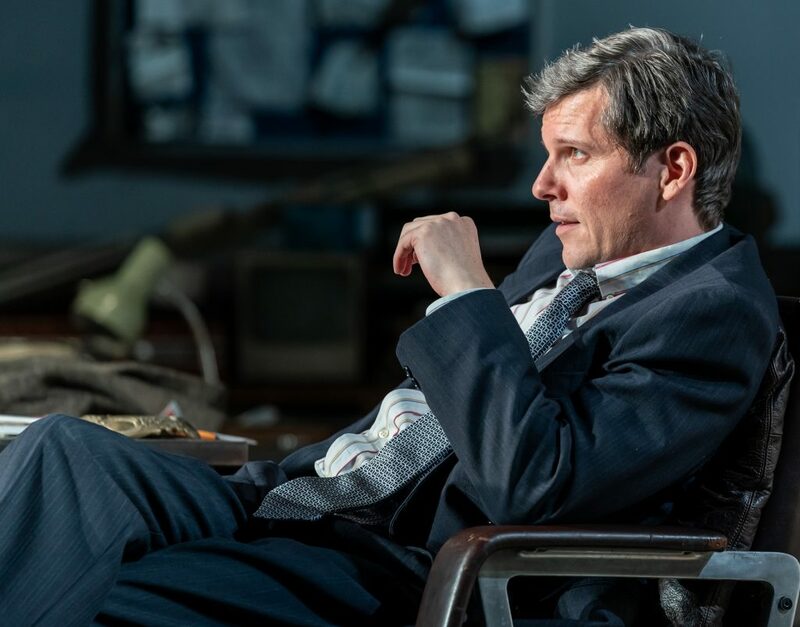 Nigel Harman in Glengarry Glen Ross. Images Marc Brenner. 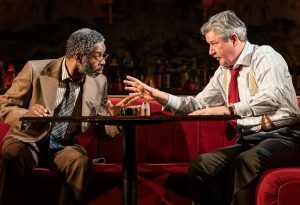 David Mamet’s razor-sharp dialogue is never better than in his Pulitzer Prize-winning play Glengarry Glen Ross, his post Death of a Salesman pitch about trying to survive in a cesspool of money hungry estate agents. After a sensational West End revival Sam Yates’ production is now touring the UK and it opened last night at Milton Keynes Theatre with its all male cast on top form. But there’s something missing. 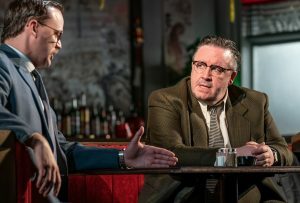 The script is incendiary, the performances – especially from star Mark Benton as struggling realtor Shelly Levene – top notch, yet it feels toneless. 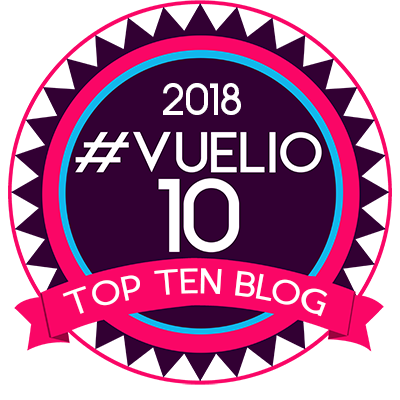 The drama comes out firing on all cylinders and maintains that same high octane, frenzied, testosterone-fuelled intensity throughout its entire 85 minutes. It’s exhausting. I came out wondering how the seven-man cast coped with keeping down their collective blood pressure after such an intense, angry performance. You can’t help but be impressed by Mamet’s insight into the cutthroat world of American real estate brokers. The problem is that estate agents are generally reviled here in the UK so it takes a lot for us to care one jot about how tough their job is. Glengarry Glen Ross, famously made into an Oscar-winning film starring Al Pacino, Jack Lemmon, Alec Baldwin, Ed Harris, Alan Arkin, Kevin Spacey and Jonathan Pryce, is set in 1980s Chicago where a group of brokers have been told that they face being fired if they don’t top the sales board. Some of them are desperate, especially Shelly “The Machine” Levene who was once top dog but is now struggling to make any sales. The play opens with three brief scenes set in the local Chinese restaurant where, firstly, Levene begs for help from the office manager, the uptight and inscrutable John Williamson (Scott Sparrow). It’s followed by a riveting and beautifully played exchange between nervous agent George (Wil Johnson) and Denis Conway’s calculating, devious and senior colleague Dave Moss. 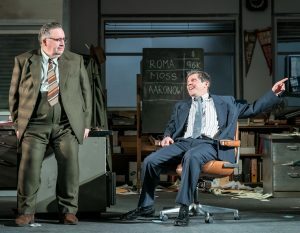 The final two-man scene, which lacks the clout of the other two, sees Nigel Harman’s slippery Ricky Roma move in on unsuspecting mark, the nervous James Lingk (James Staddon). It soon becomes evident that these men are prepared to engage in any number of unethical, illegal acts — from lies and flattery to bribery, threats, intimidation and burglary — to sell undesirable real estate to unwitting prospective buyers. Benton makes a compelling Levene who is every bit as tragic as Arthur Miller’s failing salesman, Willy Loman. He’s down on his luck, looking for a break and terrified of losing his job. The American Dream has never looked so fragile. Harman is perfectly cast as Roma, a slick, charming and utterly ruthless salesman at the top of his game who is impervious to the pain and anguish his hard sell causes. He remains intimidating and single-minded even when his target breaks down in tears in front of him begging to be let out of his contract. As I said. Everyone gives a stellar performance. I loved the interplay between Johnson and Conway, their quick-fire banter a succession of half sentences with one interrupting the other with immaculate timing. But the taut structure of the play is destroyed by an interval put in just 35 minutes after the start. The entire play is only 85 minutes and ought to be played straight through – no matter how much the producers want to boost bar sales at the various theatres on the tour. I guess it happens because there has to be a complete change of Chiara Stephenson’s beautifully well-observed sets – from Chinese restaurant to grubby downtown office – yet there has to be another way. A great character-led play but its intimate structure is lost in the vast auditorium of Milton Keynes Theatre where the audience is distanced and alienated from the visceral and furious exchanges between protagonists. 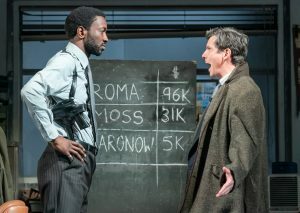 Glengarry Glen Ross runs at Milton Keynes Theatre until Saturday before continuing to Theatre Royal, Glasgow, Richmond Theatre, Theatre Royal, Brighton and New Theatre, Cardiff.